Joshua Hyde, acting president of the Kansas City Atheist Coalition, and Veronica Brown, acting vice president of the Kansas City Atheist Coalition, have reviewed the interview materials presented by Joseph Tennant to us with regard to his study. We gladly and willingly agree to help in the recruitment of atheist members of our community who would consent to participate in this study as it has been presented to us. This is a great opportunity not only to help advance our knowledge about morality and cultural influence, but also make a little extra spending money in the process. Participate in a Psychological Study on Morality! My name is Joseph Tennant, a PhD student studying psychology at the University of Chicago. I’m hoping to recruit participants for a study on morality as part of my dissertation research. The study will consist of an interview that will focus on questions about a series of scenarios and your judgments about them. Participation is confidential and totally voluntary. Interviews will take roughly 45 minutes to an hour, and you will be compensated $10 for your time. If you’d like to take part, please contact me at jctennant@uchicago.edu. Thank you and hope to hear from you soon! 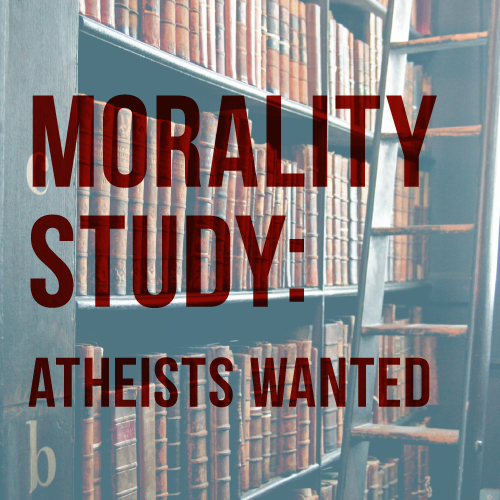 5 Comments to "Morality Study: Atheists Wanted!" We are in our 70’s. My husband Gene has always been a nonbeliever. About 5 years ago, my mother in law asked me to study the Bible with her. Then it was the gospels. Then just the gospel of John. I tried to harmonize all four, that was before I realized that someone had done this years ago and give it a name. Too many difference. Too many questions. I then tried to find what the Bible said it would take to be saved. Again conflicts. I believed pray helped. Ask and you shall receive….even though many things I asked for never happened. Heard about the pray study written up in the NYTimes in 2006. My husband would probably agree to take part in your study. Don’t worry about the money or donate it to the KCAC. 71 years young. Grew up in Iowa on farm. My Dad(adopted at 4 with brother almost 6) was not religious. Mom taught Methodist sunday school and officer of PTA. Seven years old I got to my mother sunday school class and she was shocked to find out I did not believe many stories in the Bible. Jesus did not have any medical knowledge he believe people were possessed by demons and by saying magic words and laying is hand on them he might be able to chase demons out. and there are no demons, mom. She wasn”t so sure there might be.A God who could create everything in six days and then needed to rest? The Garden Of Eden where they had everything they needed? And a Tree of the Knowledge Of Good and Evil that Adam was told not to eat? Ridiculous stories to me. My brother joined the Marines after high school in 1958 and during the summer I bought a notebook and went through the Bible taking notes and tried to have discussion with mom, but I already knew she believed you were not to question the Bible, which she believed , as taught, that it was the Word of God, and she was afraid of going to Hell and liked going to Heaven when you died, My brother and I had to say Grace before meals and thank God for our food, but over the uears I did not see God doing anything for this food so I started to give thanks to the people we knew in ouir community and my parents for the food we ate and it wasn’t long before the prayers were dropped. During my Junior years we had to say the Pledge of Allegiance with the “under God” just added in 1954 and I got my mother to help compose a letter to the ACLU and I mailed it in our mail box was the highway and rode the school bus to school. Mom said they never responsed and about 12 years later she admitted that she went down and took it out of the mail box and through it away. She said she was afraid of being ostracized in the community if the case became public. I would be pleased to take part in your study. Though, I am from Australia. Not sure if you are only looking for local participants. If not, feel free to get in touch with me. Don’t forget to contact Joseph at jctennant@uchicago.edu if you’d like to participate. That way you can arrange for your interview time and location. Sorry, only open to those local to the Kansas City area at this time—Joseph will drive to meet you, but he has his limits! I am interested in this. I would love to get involved with this organization….